It was a GRAND evening! An evening to retrospect! In all these years, I’ve achieved my share of success, failure, praise, criticism, honour; and then here comes a retrospective. 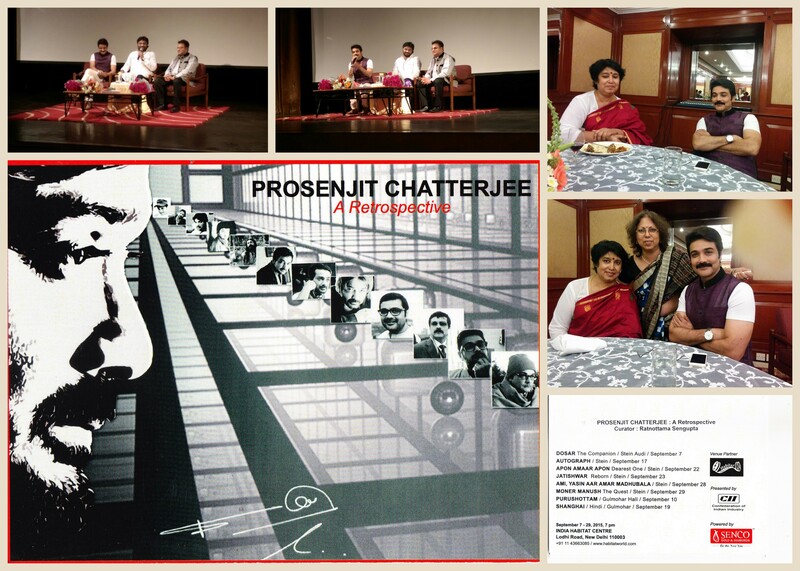 It was a wonderful initiative by Curator Ratnottama Sengupta, India Habitat Center, CII and Senco gold and diamonds. I’m touched! Truly touched! It was the opening day on 7th September and people from all over Delhi, Mumbai and Kolkata were invited for the Retrospective. I am glad that they took out time from their busy schedule and came to share the joy. Films have a different language. Hours spent talking about films and their treatment with different people. One scene, one dialogue can be interpreted in different ways by different people. And I’m happy that my film has been able to excite the audience to talk about it. Thus films live; through people and their discussion. Among the guests there was Taslima Nasrin who was invited to attend the event. We talked about films and many more. I’m really amazed to notice her knowledge about films. And not only films; her perspective on art, culture, literature is commendable! She has an energetic aura which changed the atmosphere of the event. There are some people who have the capability of changing an atmosphere with their individuality, the goodness of their soul. She is one such kind. And then there was Babul (Babul Supriyo) who just made the day with his quick wit and charm. Jaya Jaitly was also there graced the occasion with her presence. It was the screening of “Dosar”, the film that brought me National Award. After the screening, the big rounds of applause, appreciations and affection kept showering on me. Yes, I was happy. But among all these, someone was missing. That’s Ritu. He would have been happier than me then. I so missed him, his presence, his subtle affectionate smile. People praised Konkona’s performance a lot! And of course, she is a great actor and she deserves this! But what amazed them all was the art Ritu put into it. Right from the credit list till the end. He would be the happiest person today! Taslima Nasrin watched the full movie again with us. When “Dosar” released, she was the one who reviewed the film for Ananda Bazar Patrika. I was thinking, if we can arrange a Bengali Film Retrospective there where the cult films will be shown. Among the regional films, Bengali films are regarded as classics. The rich content, honest treatment, detailed study of subjects are highly appreciated and acknowledged by all! So, I think people who love cinema will be very excited for that. And our films will get some added exposure. Many people ask me if we are going to release a film there! There are people who are dying to watch Bengali movies in theatres. In fact, I proposed to release Bengali films there. At least two shows in the weekend initially. It will be a great achievement for the industry. And I’m quite confident about the fact that together we can make this possible. After the screening a wonderful dinner had been organized by IHC. It was real good time spent there. Now it’s time to bid adieu to Delhi for now. Will be going back there on 29th for the closing ceremony. Love you all! Stay blessed!